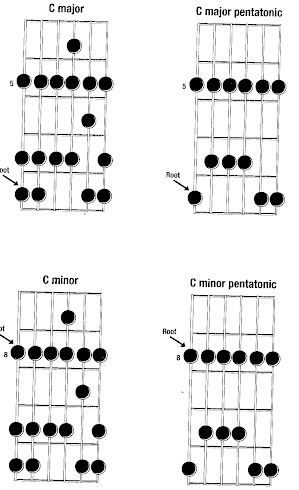 We can get into the theory behind pentatonic scales later but all you need to now now is the finger patterns for the root 6 minor pentatonic scale and the very similar blues flat 5 scale. This two scales will let you jam for hours and increase your creativity. These two scales are the most prominent scales used in Rock, blues, and pop music. You can learn the minor pentatonic scale in a few days and increase your finger dexterity so you can quickly be playing blues and rock riffs. It is not as difficult as it looks and just learning these two scales will give you the opportunity to get creative. As soon as you learn a new scale you should start to play your own riffs and licks. You do not need to spend hours and hours copying someone else's material. You will have time for that if you want to later but as you start to learn scales you can define your own signature sound and use your creativity to make your own music. If you try this out you will have a very unique sound and won't be labeled as the next so and so. You will be an original. 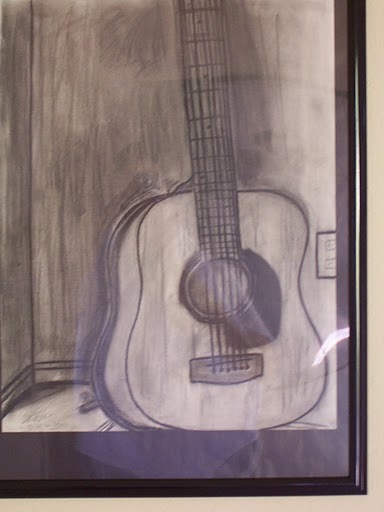 Playing the guitar is about creativity and improvising. If you want to connect your emotions to the music you play improvising is the key. Once you learn the Pentatonic Scales, especially the Minor Pentatonic Scale and your finger dexterity has improved, you will be free to create music related to whatever you are feeling.